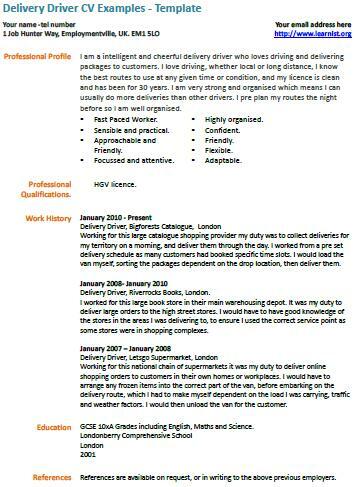 Delivery Driver CV Example – Template. Amend as suitable and write your own Cv in minutes. You can then apply for latest online job vacancies. Do not just copy paste the CV as you must have an unique and completely real CV fro your job applications. Click here to view cover letter examples! Typical interview questions and possible answers! Visit our job seekers forums today to ask your career related questions. I am a intelligent and cheerful delivery driver who loves driving and delivering packages to customers. I love driving, whether local or long distance, I know the best routes to use at any given time or condition, and my licence is clean and has been for 30 years. I am very strong and organised which means I can usually do more deliveries than other drivers. I pre plan my routes the night before so I am well organised. Working for this large catalogue shopping provider my duty was to collect deliveries for my territory on a morning, and deliver them through the day. I worked from a pre set delivery schedule as many customers had booked specific time slots. I would load the van myself, sorting the packages dependent on the drop location, then deliver them. Delivery Driver, Riverrocks Books, London. I worked for this large book store in their main warehousing depot. It was my duty to deliver large orders to the high street stores. I would have to have good knowledge of the stores in the areas I was delivering to, to ensure I used the correct service point as some stores were in shopping complexes. Working for this national chain of supermarkets it was my duty to deliver online shopping orders to customers in their own homes or workplaces. I would have to arrange any frozen items into the correct part of the van, before embarking on the delivery route, which I had to make myself dependent on the load I was carrying, traffic and weather factors. I would then unload the van for the customer.